What would bring more grace to the streets of JC than the sight of beautiful horses? Think of the joy it would bring to children when they see them. It's a step back in the right direction. Cant wait for the Animal rights activist to show up. The NJ State Police had three mounted troopers tonight at Exchange Place... have to admit my reluctance to see the JCPD unit reactivated, but the troopers and their horses were well received by the commuters with smiles and camera flashes. Gonna get spent anyway one way or another. Watch the cost overruns on the justice complex as they pile up for instance. Go for the horses I say. Hey, you're gonna get beat up anyway--you're in Jersey City. May as well add a little grace and finesse to the streets. Not much more beautiful than a horse. The kids will love seeing them. you do realize those are idiotic reasons to spend hundreds of thousands of dollars? My first thought was "horses, cool" but really, that's the problem. Too much focus on being showy and not enough on the basics. The revenue required for this vs. any benefits could be put to far, far better use, and given the current climate, with property taxes that continue to climb, the attitude should be how can we reduce costs (not "gee, we deserve this!). This reminds that too often for the powers that be, it's more about show, rather than substance. I remember horse patrols by the square and by PS#11. Cops on horses have a good vantage point, and are very visible. More so than on bikes. I think that the more JC becomes an extension of NYC, it's inevitable that foot patrols will be back just like in NYC. I remember the old horse patrols as a kid--pretty cool. We used to go down to the stable over on Johnson Avenue near the SPCA and pet the horses when they were out of their stalls. I think mounted police in fact do normal neighborhood patrolling. I don't know why the bike squad was ended. What I found interesting there is they were comparing it to foot patrols. You never see JC cops out of their cars unless they're responding to a call or they're moonlighting on a construction site. They also exaggerated quite a lot saying "Police on horseback are 12 feet tall". More like 8 ft, does little for the article's credibility. Do the cops still drive through HP on the footpaths? Since my kids are no longer small I'm not there much, but when I would see that, it was iconic of everything wrong with the way they police. I'm not against horses per se, they are quite romantic. I just find the proposal a distraction not a solution. Not commenting cost, but how is putting a cop on a horse taking him/her off the street? I don't think its a stretch to assume that a mounted cop will not be responding to normal calls or do normal neighborhood patrolling, assuming JC cops actually patrol at all. Wasn't the rationale for ending the bike squad that more cops were needed to respond to calls? If you look closely, there's a step just above the rear wheel on the left. You do need a bit of momentum though. Seriously, who in their right mind thinks a police force that is unable to do even minimal traffic enforcement should be messing with horses? By my rough arithmetic a horse probably costs yearly the same as a cop, plus a cop is being taken off normal street duty to be on a horse. So horse cop costs us 2 street cops. I don't know about you, but when I'm on my bicycle, I'm constantly focused on surrounding traffic for my own safety. An officer on horseback has a much wider view and is far more visible to other traffic. Nothing that says we can't have both. According to studies in the UK, mounted police interact with the community far more than officers in cars and are far more mobile than officers on foot. If only there were a vehicle that was far less expensive to purchase, maintain and transport than a horse, yet brought officers closer to the community and gave them mobility through parks and traffic. 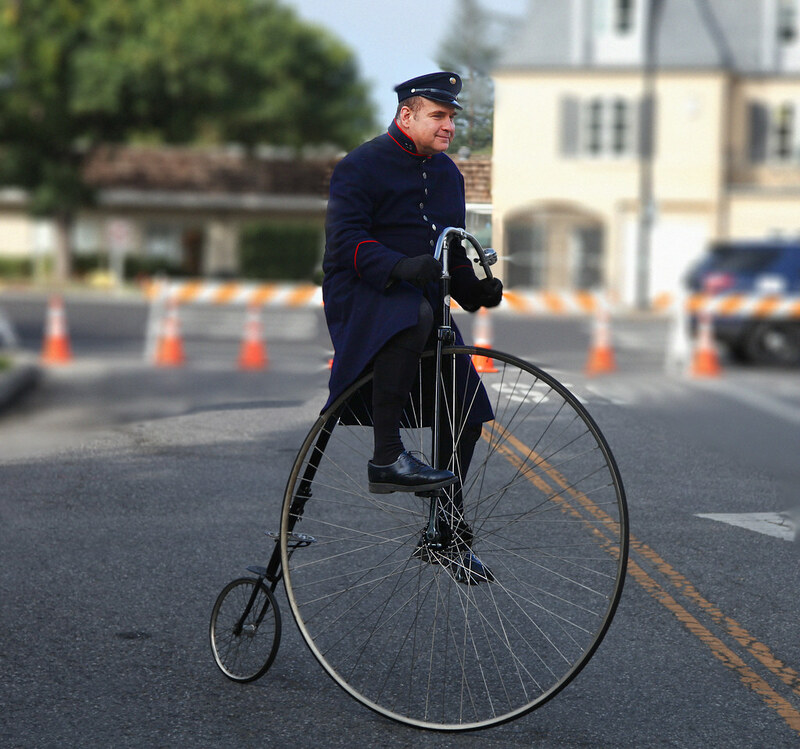 Say, something with 2 wheels that actually also kept the officers physically fit. Why in Gods name? About the only advantage a horse has over a bike is being able to see over crowds in a riot and to intimidate people. Get the cops out of their cars, on the streets, and giving traffic tickets! JERSEY CITY — Jersey City is bringing back police horses for the first time in 46 years, unless the City Council says nay. The nine-member body will hear a measure next week that would authorize the city to use 605 Monmouth St., located in an industrial area of the city near the approaches to the Holland Tunnel, as the site of stables for police horses.